Although mobile robot systems are not prevalent in U.S industrial manufacturing, they are high on the wish list of many companies. 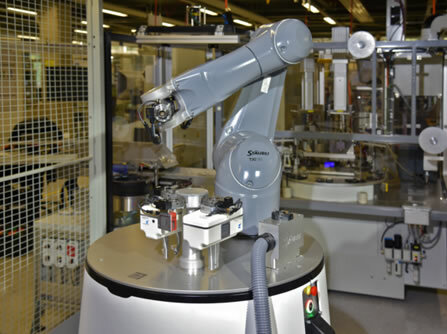 Stäubli Electrical Connectors is already using them to great effect, taking advantage of the flexibility that mobile robot assistants bring to the assembly line. operate flexibly and perform any other task, if required. Stäubli Electrical Connectors is one of the world’s leading manufacturers of electrical connectors for all industrial sectors. The company not only sets the benchmark in terms of product quality, but also leads the way in innovative production technologies. In the manufacture of their broad-based product range, the Swiss-based specialists favor hybrid assembly systems that combine fully automated and manual workstations. The only downside to this strategy is that the line comes to a standstill if an operator is absent due to illness. In addition, unmanned night shifts are not possible. 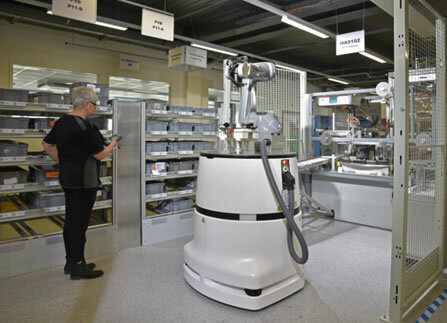 The company now has the optimal solution: the HelMo mobile robot system from Stäubli Robotics. HelMo is capable of navigating with complete autonomy by permanently monitoring its environment with three integrated laser scanners and can perform its tasks either fully automatically or in collaboration with humans. Once trained, HelMo can handle almost any manual job on a variety of assembly lines. This production assistant navigates to its own workplace, decelerates or stops when human colleagues come too close, and then continues its process. Built around a six-axis standard TX2-90L robot with a payload of 15 kilos and a reach of 1,200mm, HelMo comes with a sophisticated safety package that meets the strict requirements of category SIL3/PLe. its work station, slows down or stops if people or objects come too close. As soon as HelMo arrives at its workplace, it spends a few minutes prepping itself for the task at hand. The robot positions itself precisely within a tenth of a millimeter by referencing three permanent orientation points at the workstation. HelMo then connects itself to the fixed supply sockets for electricity and compressed air by means of a multi-coupling – also from Stäubli – and starts its shift. To enable HelMo to operate flexibly, its designers equipped it with an automatic tool change system from Stäubli Connectors. So, today it could be the placement of connector housings and contact pins, whereas tomorrow it might be some other stage in the assembly process. In the factory, HelMo is regarded less as a robot and more as an assistant who is flexible enough to help out where needed. The intention is not to replace human labor with mobile robots, but rather to deploy HelMo as a flexible stand-in and thereby increase the availability of hybrid assembly lines or cope with peak demand. Illness-related or other unforeseen absences among the human workforce are no longer a cause for concern. Because of HelMo, the delivery capability of the company has been significantly optimized. For more information, visit www.staubli.com.